Telecom equipment makers including Cisco, Samsung, Ericsson, Nokia, Intel and Sterlite Tech (from India) will be investing more than Rs 4,000  crore in India, announced Telecom Minister Manoj Sinha Saturday at the third day of the India Mobile Congress (IMC) 2018. That investment commitment is in line with India Prime Minister Narendra Modi‘s goal to achieve a capital gain of $100 billion (about Rs 7 lakh crore) by 2022. The amount invested will increase further, said Sinha, adding that the investment commitment shown by the equipment manufacturers is a part of government’s ambitious policy target to achieve Rs 7 lakh crore worth of investment by 2022. Sinha said discussions and announcements at IMC show that India is ready for the emerging 5G services. The 5G technology (based on the forthcoming IMT 2020 standard) would facilitate massive machine-to-machine (M2M) communication and has many other applications. Note 1. 4000 crores (= 400000 lakhs) is equal to 40000 million (40 billion). 40,000,000,000 INR is equal to 544,400,000 USD @ 73.48 Indian rupees to 1 US dollar. These are the first set of investments flowing in after the announcement of National Digital Communications Policy. In August this year, the India Cabinet has approved the National Digital Communications Policy 2018 that aims to attract $100 billion of investment and creation of 4 million jobs in next four years, in addition to an aggressive focus on next-generation of technologies. However, the investments will be made over a period of next one-two years, according Telecom Secretary Aruna Sundararajan. Among all these telecom equipment makers, Sterlite Tech is the only homegrown (Indian) company that locally produces end-to-end optic fiber gear, a critical digital infrastructure required to increase 4G-LTE footprint and enabler of upcoming “5G” technology roll-outs. Meanwhile, Korea’s Samsung, Sweden’s Ericsson, Finland’s Nokia and the US-based Cisco have already partnered with India service operators and the telecom department to conduct field trials and demonstrate India-specific 5G use cases. Industry experts discussed challenges in the digital communications during the three-day India Mobile Congress 2018 event, which saw participation from 20 countries and 300 companies, Sinha said. Sinha added that discussions and announcements at the event show India is ready for the emerging 5G services. The 5G technology could facilitate massive machine-to-machine communications and has multiple usages. The India Mobile Congress 2018 was organized jointly by the India DoT and industry group Cellular Operators Association of India (COAI) which represents telcos such as Bharti Airtel, Reliance Jio and Vodafone Idea as well as gear makers such as Huawei, Ericsson, Nokia, Cisco and Samsung. Sundararajan said IMC has generated more enthusiasm around 5G and the government has already committed to be at par with the world in launching this next generation services. “We have already demonstrated government intent that India does not miss the 5G bus. We have already started to take initial set of action to make an enabling environment. We expect actual allocations of spectrum (for 5G services) to begin in the second half of next year,” Sundararajan added. 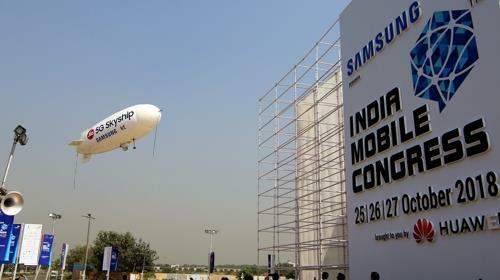 At IMC 2018, Samsung announced its plan for India’s first large-scale 5G trial, scheduled to take place in the first quarter of 2019 in collaboration with the Department of Telecommunications (DoT). “Our partnership with Reliance Jio has empowered millions, making their everyday lives better. Our roadmap for 5G showcases our strong commitment to India. We will continue to be a partner in Government of India’s Digital India mission,” said HC Hong, President and CEO, Samsung Electronics SouthWest Asia. Leading Disruptive Changes Using 4G in Digital India Since 2012, Samsung has been a key partner of the Indian telecommunications industry. During President Kim’s keynote speech at the IMC, he said that Samsung has successfully built the world’s largest greenfield and the most advanced 4G LTE networks nationwide by partnering with Reliance Jio. At IMC 2018, Samsung showcased how its 5G solutions can enable a variety of 5G-powered business models and scenarios, including: 5G home broadband services, Smart Cities and Smart Agriculture. Samsung’s 5G Skyship (see photo below), which was developed in partnership with Korea Telecom, was flying over the exhibition center to demonstrate first response use cases. Samsung says it has been a pioneer in developing 5G solutions using its technology and experience. With its successful development of the first commercial ASIC-based 5G modems and mmWave RFICs, the company has been manufacturing compact-sized 5G radio and router devices and CPEs. Samsung says its years of commitment to R&D investments since 2000 have come to fruition, as the company has been selected by the world’s leading operators such Verizon, AT&T, Sprint and SK Telecom for both 4G and 5G solutions and services. At the root of this achievement are Samsung’s end-to-end solutions spanning network equipment, devices, chip sets and the world’s-first regulatory approval of 5G equipment by the U.S. Federal Communications Commission (FCC). Samsung will continue its legacy of 4G LTE to enable digital transformation and provide a seamless path to 5G. Verizon has chosen Samsung Electronics as a major supplier in the U.S. telco’s push to offer high speed fixed access internet and other services over its wireless network. Financial terms of this “5G” business relationship weren’t disclosed. Samsung’s “5G” Fixed Wireless Access network products (including 5G home routers and 5G Radio Access units) will be used for commercial deployments. Verizon says its “5G” fixed access network will launch in the second half of this year in Sacramento, CA, which is more than two full years before ITU-R WP5D completes its IMT 2020 standards. Verizon plans to add the same “5G” fixed broadband access service in four other U.S. markets later in 2018. It will use cellular antennas to beam high-speed internet into consumers’ homes. Samsung will make network equipment for Verizon—including the small boxes that will sit inside each home, receiving the signal and translating it into WiFi— the companies said Wednesday, January 3, 2018. Verizon said last month it would also use “5G” network equipment made by Ericsson for commercial launches in other U.S. markets. Verizon estimates the market opportunity for initial 5G residential broadband services to be approximately 30 million households nationwide. In addition, it says that the 5G commercial launch will not have a material impact on its consolidated Capex in 2018 and that it expects its full-year 2018 capital spending program to be consistent with the past several years. Last year, Verizon began “5G” fixed access trials, focused on home broadband service, in 11 U.S. markets from New Jersey to California. Samsung will provide network gear for Verizon’s launch in Sacramento, where customers will be offered the option of purchasing the faster wireless access capability. Verizon and Samsung collaborated on 5G trials in parts of California, Georgia, New Jersey, Massachusetts, Michigan, Texas, and Washington, D.C. Verizon and Samsung said that those trials revealed that a single 5G radio could reach the 19th floor of a multi-dwelling unit, and that broadband service was achieved using line of sight, partial Line of Sight (LOS) and even non-LOS connections. They also claimed that “environmental factors” such as rain and snow, did not interrupt “5G” based broadband service. “5G” carries the potential to disrupt the broadband fixed access market for triple play services. That market is currently dominated by cable/MSO providers like Comcast Corp. and Charter Communications Inc, but AT&T is also there with its U-verse and AT&T Fiber offerings. Note that fixed broadband Internet access is not one of them! Arthur D. Little has written a report called “5G deployment models are crystallizing” in which it makes the case that telcos need to find use cases now, if not to reap the benefits of being early to market then as a defensive measure. Where in the past only other telcos had the wherewithal to roll out a new generation of wireless technology, ADL points out that that’s no longer true. Non-telecom players are moving into the 5G space, including Google, Facebook, Apple, Hitachi, Scania, NEC, Ericsson, and Comau. Government agencies and telecom operators expect broad “5G” availability in many markets by 2020, but again, that won’t be based on ITU-R ratified IMT 2020 standards. “5G is a reality,” said Kim Young-ky, president of Samsung’s networks business, in an interview with the Wall Street Journal. South Korean technology giant Samsung, a fairly small player in the network equipment world, believes its knowledge making products and components could give it an edge with telecom customers seeking to sell connectivity to a wider range of devices. Samsung’s network business generated some 2 trillion ($1.9 billion) to 2.5 trillion won in 2017, according to research firm Counterpoint Technology Market Research. It targets annual revenue of 10 trillion won by 2022, a Samsung spokesman said. The average U.S. consumer uses about five gigabytes of mobile data a month, Mr. Kim said. But after 5G becomes more ubiquitous in the next few years, he believes consumers will eventually use closer to 100 gigabytes monthly on new services such as virtual or augmented reality programs—or even from driverless cars that will require greater data speeds to rapidly process traffic conditions. About two years ago, Samsung combined about 1,000 workers from different divisions including handsets, network and its central research-and-development group, to create a “Next Generation Communications Business” team dedicated to 5G. “With 5G, it’s going to be expanding beyond your phone,” Kim Woo-june, a senior vice president in Samsung’s network business, said in an interview. The industry’s first mobile phones with 5G capabilities aren’t likely to debut until 2019, he added. AT&T last month said it would launch a “5G” trial site in Texas, after tests in other markets. Sprint Corp. and T-Mobile US Inc. have said they are working on nationwide “5G” networks, targeting late 2019 or 2020.